Donald Trump's election means it's truly organize or die time for the labor movement. Many years ago, I spoke to a group of labor leaders. I talked about labor history, and how we all love and revere the movement of yesteryear. I talked about how we worship and adore the era of workers rising up against the machinery of the status quo and the heroes who emerged as leaders of those movements. And then I told them that if we are not cautious, that the next worker uprising will be against us. I warned them of the dangers of becoming so intertwined into the fabric of the establishment that the working class may not readily be able to discern the difference between the two. For the record, my speech that day was not well received. In fact, come to think of it, a pretty long period of time elapsed before they ever asked me to say anything to a group again. But that doesn’t make it any less true, even if they didn’t want to hear it. Last night’s election, in my mind, is a sign of such an uprising. There is no need to try and dissect the entire election. There are enough supposed experts doing that today already. And time will tell soon enough what it means for organized labor to live under the new all-Republican regime. But there has been a lot of talk about white America, and that is something I know a little something about. Yes, a small segment of Trump’s supporters are bigots. And some are racists. But the vast majority are neither. Living here in Iowa, in a rural white community in a mostly white state, I know these people. Most are neither of those things. And when the pickup truck with a Trump sticker pulled up at my polling place, it wasn’t a gun-toting, angry, immigrant-hating redneck who emerged, but rather a union man wearing an AFSCME PAC contributor jacket. More than anything, this election (in my mind) was about people who are disgusted with the status quo. People who have had little or no interest in voting before came out and voted because their health care premiums have skyrocketed (they blame Obamacare), or they remember losing their factory jobs when Bill Clinton’s NAFTA took effect. Many of them were Democrats once (or still are). They voted in overwhelming numbers, not for Trump, so much as against what they perceive to be the preordained establishment candidate being crammed down their throats. Even among union members, the disgust for this cycle was palpable. And despite populist movements in both anti-establishment directions (Trump and Bernie), most union leadership inside the Beltway seemingly further embraced the establishment candidates, further alienating membership on both sides of the aisle. There is a tenet of union organizing that says you identify individuals who are vehemently opposed to you, and then you don’t ever contact them to avoid angering them into voting against you. Labor pushed forward, and we sent the usual mailers, knocked on the usual doors, and made the usual phone calls. The result was, well, Trump. And while those of us who have been in union leadership recognize the importance of being involved in the political process, and the damage the Right intends to inflict upon us at the first opportunity, our membership has largely come to view the machinery of organized labor as little more than a funding arm of the Democratic Party. I mean, truly, where else can you find a business model where you can invest ten or twenty million dollars in a cycle, get absolutely nothing out of it, and then think it wise to try and double your investment the following cycle? While we may agree or disagree on the wisdom, the membership, and the people of this country, have come to yearn for something else — almost anything else. And in a world where perception is reality, and where populism is now king, to be content to allow the perception to exist that our entire future as a movement hinges upon every election cycle, and that our only hope is to elect ever more Democrats, is an all-too-apparent recipe for disaster. Our future as organized labor, most likely, will now depend upon our ability to genuinely mobilize and fight like hell for our survival on every front. Wisconsin is here and now for us all. If we cannot change, and quickly, from just servicing members and putting all of our collective political energy into the electoral process, then I fear there will be precious little left to fight for when the dust settles. Historically, this populist movement is not unprecedented. 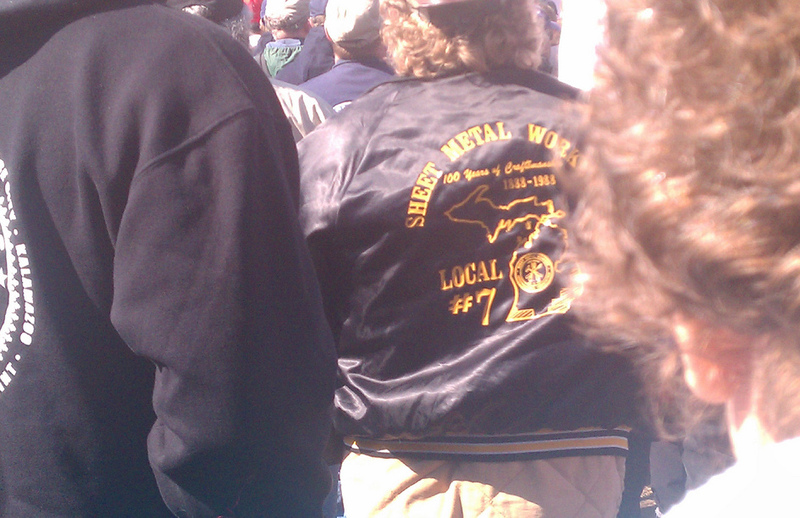 And historically, organized labor has always been running from behind to catch up to such movements when they occur. Our action, or lack thereof, in coming months, will determine the fate of the movement our children and grandchildren will ultimately inherit. I only hope that the leadership inside the Beltway recognizes it before it is too late, and starts contingency planning today, instead of focusing solely upon the next cycle in two years, because today, people are more valuable to us than PAC dollars, and our ability to form an actual movement to respond to attacks is more urgent than wondering which Democrat we will run for office in two years. Where will we be when Trump appoints a Scott Walker to head up the Department of Labor? Or when official time is taken away in the federal sector? Or when all of us have to hold annual elections to re-certify our contracts? All of these things will ultimately move to turn the tide in some future election cycle, but in the here and now, it is far too high a price to be paid for a Democratic victory that will merely serve to stop the hemorrhaging. It’s truly organize or die time, and that doesn’t mean simply signing up new members — it means moving all of them to action around their issues, not ours, because clearly, there must be a difference between the two that we have missed along the way. Donald Trump’s election means it’s truly organize or die time for the labor movement.